Ever since the 1989 Tiananmen massacre, I have participated in each year's March10th anniversary commemoration activity -- in places from Boston to Dharamsala, from Taipei to Washington, D.C., and from New York to Beijing. 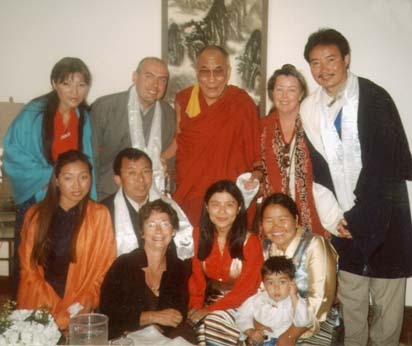 Yes, in Beijing too-- in prison, from 2002 to 2007, each year during the five years of my imprisonment there, I gave a special prayer on that particular day, March 10, for His Holiness the Dalai Lama and my Tibetan brothers and sisters. In the darkest days of my life, I drew strength and inspiration from you, my dear brothers and sisters; you inspired me, as you do today, through your endurance despite enormous grievous assaults on your language, your culture, your religion, your land, your identity, your spirit, and even your lives, and through your extraordinary struggle for freedom under the leadership of His Holiness the Dalai Lama. Today the 54th anniversary of the 1959 Tibetan National Uprising is being commemorated under heavy dark shadows. As I speak, my heart is agonized upon my thinking that another Tibetan or two in Tibet may set ablaze on him or herself in the next moment and many more are to be incarcerated or will disappear. Not long ago right here, I spoke at the Solidarity with Tibet rally on December 10 of last year. I asked you to join me in asking a question of the world leaders, including Secretary General Ban Ki-Moon of the United Nations and President Barak Obama of the United Sates: Are you a Tibetan today? I brought this question to them because I believed, as I continue to believe today, that nobody can say that he is not a Tibetan if he sees the burning flames in Tibet and is not numb to pain himself and that nobody can say she is not a Tibetan if she hears the voices cry out from the flames and is still in possession of a heart to love and a mind to understand. I brought this question to them because I believed, as I continue to believe today, that these world leaders, holding the powerful political positions they do, can hamper or promote justice more easily than others. After 109 Tibetans -- monks, nuns and lay people -- have set themselves on fire to protest the systemic and systematic repression, oppression and cultural genocide of the Chinese government on the people of Tibet, how many more will it take for you to confront the Chinese government with truth telling them unequivocally that they must stop your repressive policies which are the root cause of the crisis now unfolding in Tibet? How many more miles will the Tibetan people have to trudge in order to sound the international alarm, which we, the international community as a whole, have largely ignored both at their peril and our own? And, how much more will they have to suffer before the world leaders like you realize this is not only a Tibetan disaster but a disaster of the entire mankind and take action to stop it? I understand that the world leaders often find themselves in awkward positions where they feel that proclaimed principles must be compromised for the sake of short-term interests. 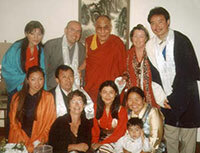 But the question of Tibet is not only a political issue but also a moral one. All of humanity is challenged. Every world leader must take this test, and just like any other test, one either passes or fails. After all, the office of each world leader will ultimately be judged by the high court of history on his or her courage, vision, and integrity. I do not know what will help stop the injustice most effectively, but I do know it will not be helped by silence. We must insist today that silence is no longer an option. Silence is indeed never an option. I call on the world leaders, on this global day of action, to stand in solidarity with the Tibetan people, to condemn the repression by Chinese authorities and to nurture dialogue with the Tibetan leadership with a view to protecting the human security and cultural identity of the Tibetan people. I also appeal to the consciences of my Chinese compatriots on this day of global solidarity with Tibet. We Chinese must realize that grievances of the Tibetan people are many and genuine, that the suffering of the Tibetan people is the suffering of the Chinese people as well, and that the government that brings such misery to the Tibetan people is the same government that is jailing our best citizens, robbing the land from our peasants, and controlling our right to speak and think freely. We must not continue to look the other way while our Tibetan brothers and sisters are crying in flames. Yes. We must draw hope from the burning flames of martyrdom in Tibet. We must not lose hope. I am impatient with injustice. I don't think it will take another 54 years. We will see home and freedom in our lifetime. I am a great supporter of His Holiness the Dalai Lama's Middle Way Approach which is upheld by the Tibetan Government in Exile. As a Chinese scholar, I believe the Middle Way Approach, full of kindness, compassion, courage, wisdom and vision, will benefit both Tibetan and Chinese peoples. Let's unite and continue to fight the good fight. My dear brothers and sisters, I will continue to fight side by side with you, will walk with you every step on the road toward home and freedom.